Writing a takeaway is the most practical step in devotional writing. The devotional’s takeaway, also called the “application,“ is the third element in the 3-part structure. The takeaway gives the reader something to “do” – an action step she can take in order to apply the devotional point. The action can be big or small. It can be obvious or subtle. Regardless, the overarching guideline to follow is this: write a simple takeaway. The biggest danger in writing your takeaway is being too specific or complex. 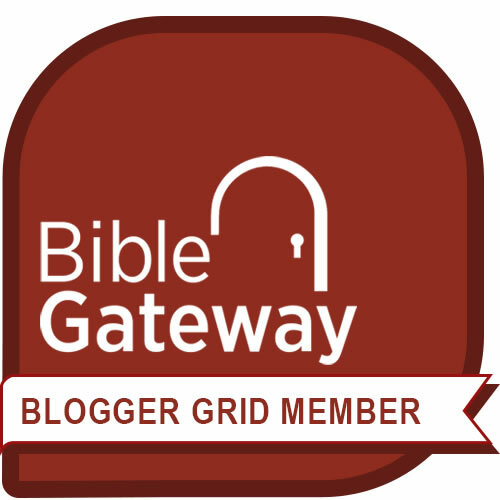 I realize this sounds counterintuitive, especially since you have already invested considerable effort in writing the devotional by being specific and detailed while choosing a scripture, identifying an illustration, and connecting the two together. But here is where this element of the devotional equation differs from the other two. The takeaway does not suggest a customized course of action. While the scripture and illustration focus on details, the takeaway points to a spiritual principle. Let’s say you’re writing a devotional for women about developing a respectful relationship with their in-laws, based on the biblical story of Ruth. Ruth’s mother-in-law, Naomi, had faced hard times and had become bitter, yet Ruth responded to Naomi with loving grace and generosity. As you write, you feel a tug to challenge wives to be loving towards their in-laws. Yet you have no way of knowing what kinds of circumstances your readers face. Takeaway #1: Take a page from Ruth’s book and show love to your in-laws by moving with them to a foreign country. Takeaway #2: How is God prompting you to adopt an attitude of grace towards your in-laws? Takeaway #1 focuses on a specific step: moving to a foreign country. It may apply only to a very select few readers. And it is not scriptural in that God does not call each of us to move to a foreign country with our in-laws. Takeaway #2 focuses on a principle: adopting an attitude of grace. It is scriptural in that God always seeks to help us grow in showing grace. Yet the takeaway is also applicable to every godly wife. It challenges each reader to bring her attitude to God for inspection, listen to His response, and then take one step to adopt a more godly attitude towards her in-laws. You can see why #2 is a stronger takeaway in that the reader’s personal application will spin out of her circumstances. If the reader already has a loving relationship with her in-laws, God may show her how to cultivate even more grace towards them, perhaps by looking for an opportunity to express her respect for how they raised their son. Or God may call her to adopt an attitude of grace by being the first to reach out in an estranged relationship. If she has experienced a deep hurt from her in-laws, God may lead her to show grace by taking steps to develop an attitude of forgiveness while still maintaining healthy boundaries. 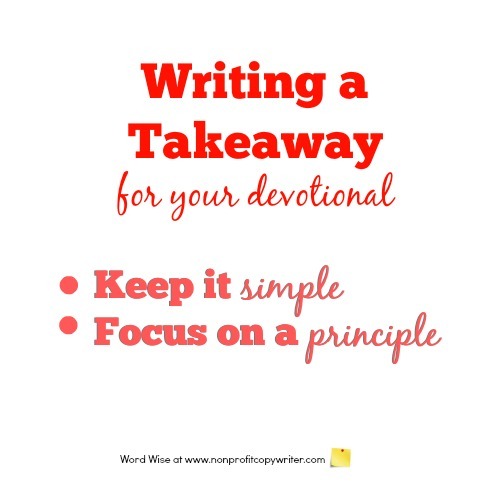 You can write clear, simple takeaways when you focus on writing about a specific spiritual principle — your devotional point — rather than a specific action step.